I’m crazy about BBQ sauce, so the first thing I wanted to make with my Multi-Purpose Shredded Beef was something drenched in that sweet, tangy sauce. 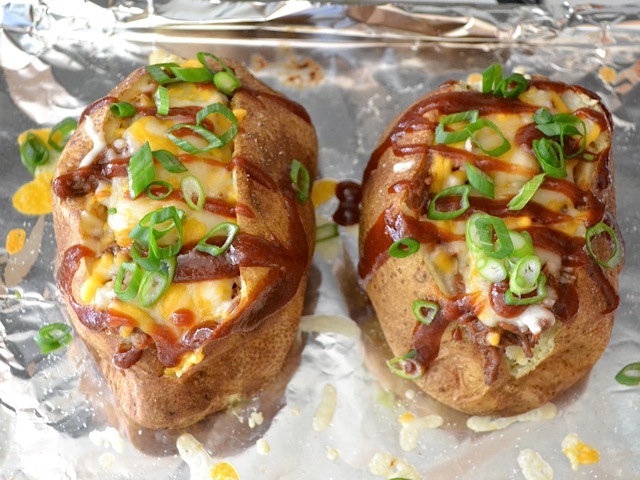 Sure, I could have just piled the BBQ shredded meat on a bun and called it a day, but these stuffed potatoes are WAY better. Once you’ve got the shredded beef made and waiting for you in the freezer, these potatoes are super easy to whip up. I took the long route and baked my potatoes in the oven so that I could have that nice, crispy skin. But, if you want a faster route, you could always microwave the potatoes or even have them cooking in your slow cooker while you’re at work. That way, dinner is practically five minutes away once you get home! These potatoes are absolutely huge, and honestly I’d probably only eat half of one and pair it with some steamed or roasted broccoli to round out the meal. Oh, and if you’re not a beef person, this would be equally as amazing and delicious with shredded chicken or pork. 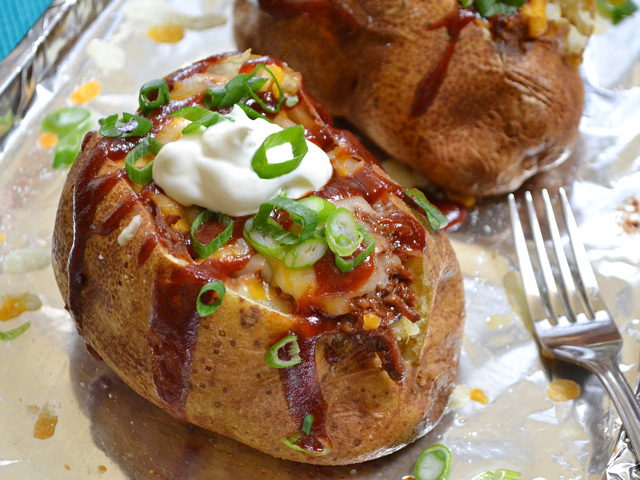 Slow cooker shredded beef, cheddar cheese, tangy BBQ sauce, and green onions are all piled into a fluffy baked potato for an easy all-in-one dinner. Preheat the oven to 400 degrees. Wash the potatoes well and then dry them off with a clean dish towel. Prick the potatoes several times on all sides with a fork. Rub about a half teaspoon of vegetable oil over the surface of each potato and then sprinkle lightly with salt. 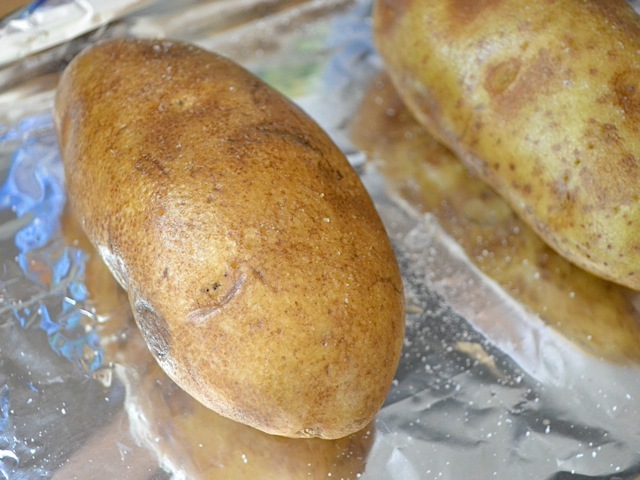 Place the potatoes on a baking sheet covered with foil and bake for one hour or until the potatoes are tender all the way through (test the tenderness by squeezing the potato with an oven mitt or clean dish towel to protect you from the heat). 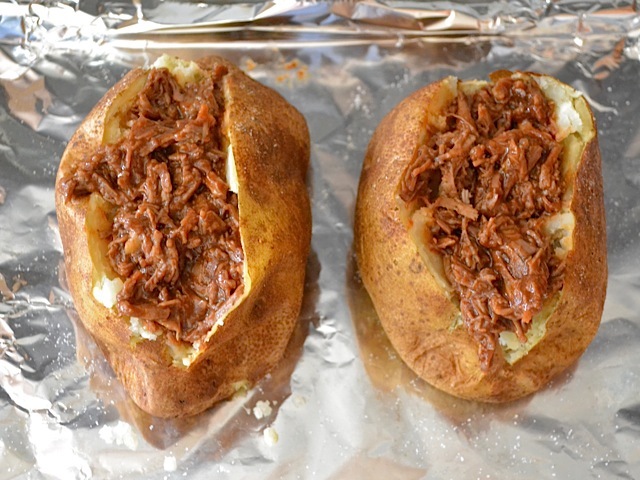 While the potatoes are baking, thaw and reheat your shredded beef. 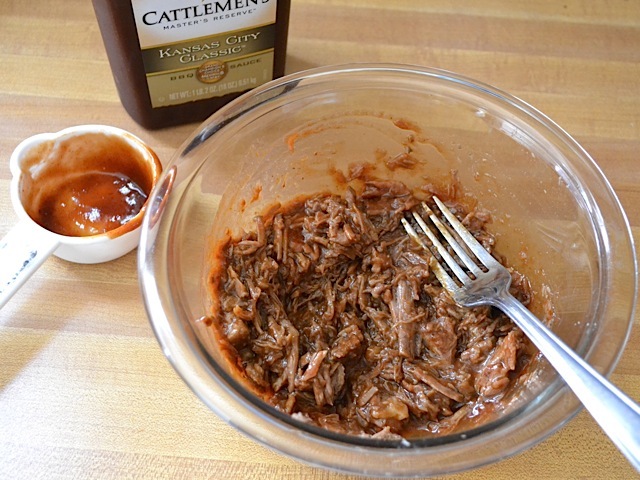 Mix 1/4 cup of your favorite BBQ sauce in with the shredded beef. Thinly slice the green onion. Once the potatoes are finished cooking, slice each one lengthwise from end to end. Use a dish towel or oven mitt to protect your hands and push each end of the potato in toward the center to make it pop open. 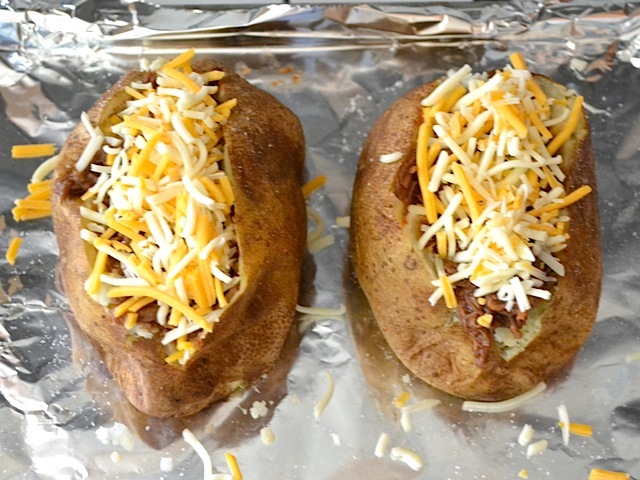 Pile half of the BBQ beef into each potato and top with about 2 tablespoons of shredded cheese. Return the potatoes to the still warm oven for a few minutes, or until the cheese is melted. 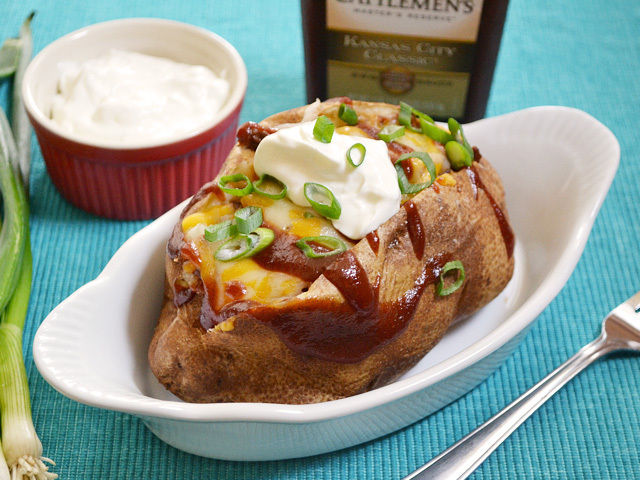 Once the cheese is melted, drizzle about one tablespoon of BBQ sauce over top of each potato and then sprinkle with green onions. Place of dollop of sour cream on top of each and enjoy! Start by preheating the oven to 400 degrees. Wash and dry the potatoes well. Drying them off well will help you achieve a crispy skin. Poke the potatoes several times on all sides with a fork. This will allow steam to escape as they bake. 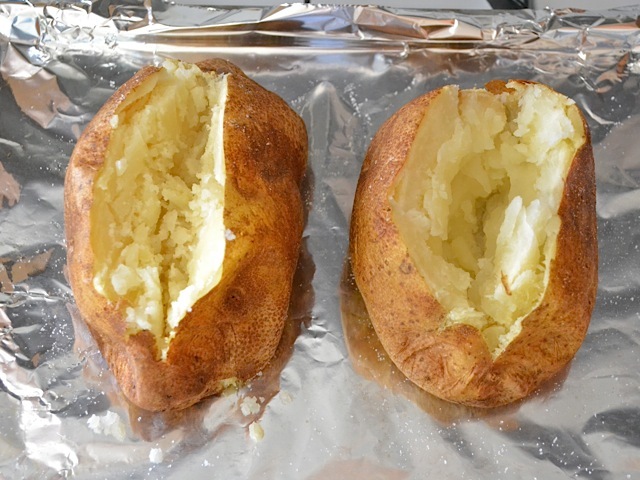 If you don’t prick holes in the skin, the steam pressure could build up and very likely make the potato explode. Not good. Rub about a half teaspoon over the surface of each potato and then sprinkle them with salt. The oil helps crisp up the skin while keeping the inside moist and fluffy. Place the potatoes on a baking sheet covered with foil and bake for one hour, or until they are tender all the way through. To open the potatoes, slit them from end to end with a sharp knife. Grab each end of the potato (use a dish towel to protect your fingers from the heat) and push in towards the center. 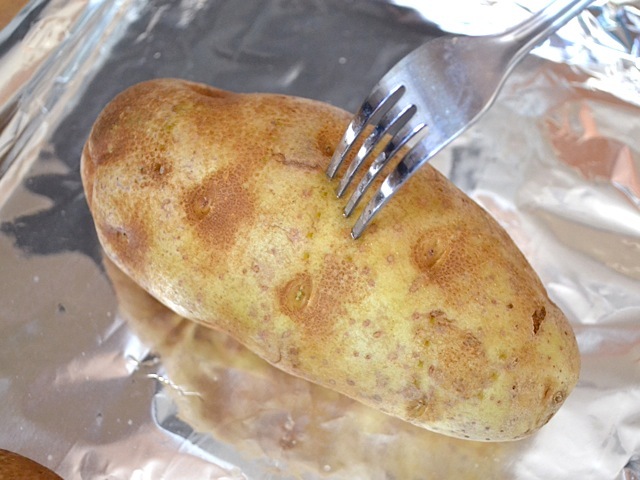 The potato will pop open along the slit. 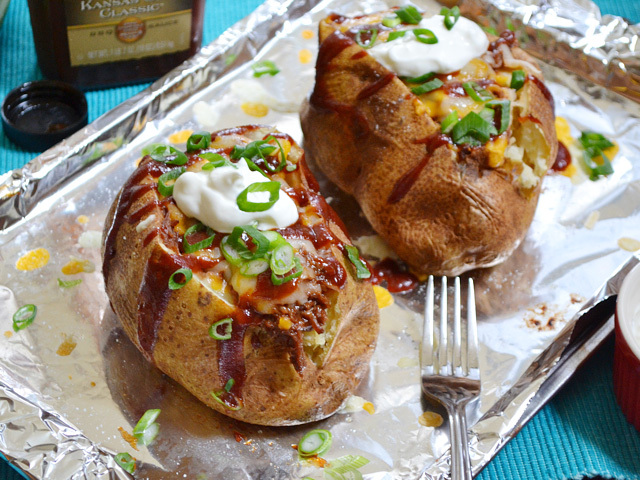 Stuff half of the BBQ beef mixture into each baked potato. Top each potato with about 2 Tbsp of shredded cheese. Cheddar is best, but monterrey jack is pretty good with this, too (I used a mix). Pop the potatoes back in the oven (while it’s still hot) for a few more minutes, or until the cheese is melted. After the cheese melts, drizzle about one more tablespoon over each potato and then sprinkle with the sliced green onions. Top with a dollop of sour cream and you’re good to go! YUM. Did these fasst in the microwave, put butter down inside then filled with bbq beef and cheesed top. Finished,in oven,for 8 min. Excellent! Made these last night but did not have BBQ sauce, so instead I used sauce that I had leftover from the Asian Sticky Wing recipe I had used the night before. Absolutely amazing substitute and amazing recipe(s)! Will definitely have again soon. My favorite Restaurant makes these big bakers but does not melt the cheese and is just awesome that way. They put butter sour cream chives Shredded smoked pork and you can add barbecue sauce to it if you like. Best potato I ever ate and always order this and never have been disappointed. I made these two weeks ago and they were a big hit in my house of 5. Love your BudgetBytes. The past two months were tuition time in our home and your recipes have helped me feed everyone better…with less! Thank you. Our local Ren Faire makes something like this (they use bbq turkey). It’s one of the things I miss during the rest of the year – no more! I can’t wait to make these! These were really good. My husband kept protesting that a baked potato is a side, not a meal… Until he couldn’t finish his lol. Lots of win. Plus, it was nice to have an easy meal that I could put together quickly.